As well as possible effects on humans, possible effects of EMFs on various animals (for example, cows, sheep, pigs and horses) have been studied a number of times. No detectable effect of EMFs have been found on, for example, health, milk production, fertility, behaviour, and carcass quality. Most of the research on EMFs and flora and fauna was conducted in the 1970s and 1980s. Since then little research on this subject has been performed, reflecting the general agreement that EMFs have not been shown to have any detectable effects (with the specific exceptions of honey bees in hives and trees growing close enough to lines to be subject to corona). We give here information on some studies of the effects of EMFs on farm animals. The studies we list are mainly those summarised by the 1991 Gibbs Inquiry plus more recent studies supported by Hydro-Quebec. We will be happy to add any more recent studies. The French Health Ministry "ANSES" published a report in 2015 "Conséquences des champs électromagnétiques d’extrêmement basses fréquences sur la santé animale et les performances zootechniques". It is in French only, but includes a lengthy bibliography of studies at the end. There have been several studies investigation whether cows (and deer) can align themselves with the earth's magnetic field - see full details - but the outcome seems inconclusive. We give here information on some studies of the effects of EMFs on plants, in particular farm crops. The studies we list are mainly those summarised by the 1991 Gibbs Inquiry. We will be happy to add any more recent studies. It is known that some plants can suffer leaf damage if the electric field is high enough to cause corona, which causes the tips of the leaves to dry out and can reduce growth. For this to happen, the leaves have to be sharp and pointy rather than round, and normally have to be on trees etc to raise the height nearer to the power line. Crops at ground level would nomally not be in high enough fields to cause corona. Other than this effect, the following studies have looked at crops in relation to power lines. Bees can be affected if the hive is under (or close to) a power line and they receive microshocks. This can be eliminated by screening the hive. See full details of the research on this. Other than that effect, there does not seem to be evidence of EMFs or power lines adversely affecting bees. Indeed, one study (abstract below) found that the strip of land along power lines in the USA, because it is protected from development, can be particularly attractive to bees. The land area covered by powerline easements in the United States exceeds the area of almost all national parks, including Yellowstone. In parts of Europe and the US, electric companies have altered their land management practices from periodic mowing to extraction of tall vegetation combined with the use of selective herbicides. To investigate whether this alternate management practice might produce higher quality habitat for native bees, we compared the bee fauna collected in unmowed powerline corridors and in nearby mowed grassy fields at the Patuxent Wildlife Research Center (MD). Powerline sites had more spatially and numerically rare species and a richer bee community than the grassy fields, although the difference was less pronounced than we expected. 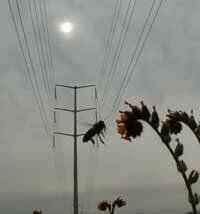 Powerline sites also had more parasitic species and more cavity-nesting bees. Bee communities changed progressively through the season, but differences between the site types were persistent. The surrounding, non-grassland landscape likely has a strong influence on the bee species collected at the grassland sites, as some bees may be foraging in the grasslands but nesting elsewhere. Improving habitat for native bees will help ameliorate the loss of pollination services caused by the collapse of wild and managed honeybee populations. This study suggests that powerline strips have the potential to provide five million acres of bee-friendly habitat in the US if utilities more generally adopt appropriate management practices. Bats use echolocation to detect prey and to aid navigation. This operates in the frequency range of 20 kHz to 200 kHz. Power lines do not produce significant fields at these frequencies, and are therefore highly unlikely to interfere with the bats’ navigation or foraging. Nor are there any reports of this happening with existing power lines. The presence of a power line has no effect on organic status. The regulations that define organic status in the UK do not even mention power lines, pylons or magnetic fields. Farmers often use Global Positioning System (GPS) to assist operation on farms. Power lines do not generally interfere with GPS, except possibly very close to the pylon itself. Most of the review bodies that have examined EMFs have been primarily interested in people rather than animals or plants. SCENIHR have included some comments, and one Inquiry which did examine the evidence on agriculture was the Gibbs Inquiry. "The current database is inadequate for the purposes of the assessment of possible risks due to environmental exposure to RF, IF and ELF." "2.10.8 There is little evidence that exposure of crops, farm animals or natural ecosystems to transmission line EMFs has any agriculturally significant consequences." The National Health Security Agency for Food, Environmental and Occupational endorses the conclusions and recommendations of the GT ELF-EMF and ETUC on health effects of ELF-EMF on animal health and animal performance. The experts' report stresses that although rare effects were observed in animals: deterioration of cognitive function in laboratory animals (exposure to >100 μT), possible decrease in milk production, the fat content and increased feed intake in dairy cow (EMC 30 μT, 30 days), etc. ; it remains difficult to comment on the direct effects health of ELF-EMF on livestock, especially since the mechanisms of action of ELF-EMF are not yet identified. The effects of stray currents are well known but their impact on the performance and health state of the animals (mastitis in dairy cows for example) in the multifactorial context of farms remains badly known. In this context, ANSES emphasizes the importance of standardization of experimental protocols, as well as the quality of the measurement of the applied fields and a good exposure characterization of animals. Note: this is now very old. We mention it here because for a long while it was the only independent review of effects on animals and plants and therefore was cited quite often. This was conducted by former Chief Justice of Australia The Right Honourable Sir Harry Gibbs G.C.M.G., A.C., K.B.E. who conducted an inquiry into community needs and high voltage transmission line development in the State of New South Wales in 1990/1991. Chapter 6 of his Report deals with animals and plants. His conclusions are contained in section 6.6. 6.6.1 Bees in hives under or near to transmission lines are adversely affected by shocks created by currents induced by the lines, but the effect can be mitigated by shielding. 6.6.2 The magnetic fields created by power lines do not affect the health or reproductive capacity of farm animals or present a danger to native fauna. 6.6.3 The growth of trees which are close to a transmission line may be reduced by the effect of corona. In any case, the height of trees on a transmission line easement will be restricted when this is necessary in the interest of safety. Any loss which this causes to the landowner should be included in the compensation paid for the acquisition of the easement. This matter is further discussed in Chapter 16. 6.6.4 From a practical point of view, the electric fields created by transmission lines have no adverse effect on crops, pasture grasses or native flora, other than trees, growing under or near to the lines.